Inexplicably, an unpredicted frigid Arctic summer has covered an additional 533,000 square miles of ocean with ice resulting in an increase of twenty nine per cent in less than 12 months. To have an idea of the magnitude of this newly formed unbroken layer of ice, it is more than half the size of Europe. This change has prodded some eminent scientists to declare that the world has entered a period of cooling that might not end until the middle of the century. A new cooling cycle would expose the computer forecasts of imminent catastrophic warming as dangerously misleading. But this has not prevented the IPCC from releasing its fifth assessment of the state of the global climate in which they conclude: “climate change has not stopped and man is the main cause.” The IPCC had downplayed the long-term significance of a slight shift in temperature stating that “due to natural variability, trends based on short records are very sensitive to the beginning and end dates and do not in general reflect long-term climate trends.” It is interesting to note that environmentalists only cite short-term studies such as the warming trend of the last sixteen years and conveniently forget to mention historical evidence prior to that period. Annual growth rings in trees give important testimony indicating how previous climate conditions occurred during their life. In the cold environment of the Finnish Lapland, trees often fall into one of the numerous frigid lakes when they die where they remain well preserved for thousands of years making it possible to accurately examine the effects of climate change over a long period of time. In April of 1975, Newsweek ran an article titled “The Cooling World” in which the opening sentence read: “There are ominous signs that the Earth’s weather patterns have begun to change dramatically and that these changes may portend a drastic decline in food production – with serious political implications for just about every nation on Earth.” Note the use of verbiage such as ominous, dramatic, drastic and serious all in the first sentence. This article is even accompanied by a graph indicating that the average trend had warmed less than one degree Fahrenheit from 1880 to 1945, sixty-five years. This was followed by a cooling trend that coincided with the post war industrial boom that lasted until 1979. The warming trend that followed coincided with the economic slowdown of the 80s and 90s. Even if there were only accurate data that went back to 1880, it is still reasonably evident that cooling and warming are natural cycles. So why all the anti-civilization hype? The entire world has heard all about the global warming myth ad nauseam—minus many inconvenient truths. Not least of which is that warming and cooling cycles take place irrespective of human activity. Perhaps radical environmentalists would do better to obsess less over the poor environment and focus on the dearth of morals in the world and apply some of their energy to, let’s say, the reckless spending by politicians instead of a .025-degree global temperature fluctuation. 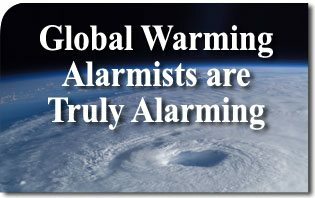 One inconvenient fact is that global warming alarmists are truly alarming.